This prompted pirates and reporters to watch torrent sites for copies of the film, and after a few hours the first torrents did indeed appear. The initial torrent spotted by TF was just over 200MB, which is pretty small. As it turned out, the file was fake and linked to some kind of survey scam. 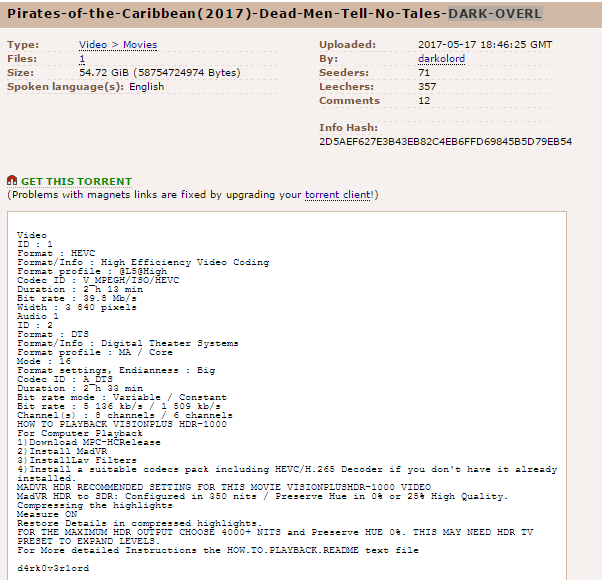 Fake torrents are quite common and even more so with highly anticipated releases like a “Pirates Of The Caribbean” leak. Soon after the fist fake, another one followed, this one carrying the name of movie distribution group ETRG. After the first people downloaded a copy, it quickly became clear that this was spam as well, and the torrent was swiftly removed from The Pirate Bay. Unfortunately, however, some reporters confused the fake releases with the real deal. Without verifying the actual content of the files, news reports claimed that Pirates Of The Caribbean had indeed leaked. The latter was also quick to point to a likely source of the leak. Hacker group The Dark Overlord was cited as the prime candidate, even though there were no signs linking it to the leak in question. This is off for a group that regularly takes full public credit for its achievements. News site Fossbytes also appeared confident that The Dark Overlord was behind the reported (but fake) leaks, pretty much stating it as fact. “The much-awaited Disney movie Pirates Of The Caribbean 5 Dead Men Tell No Tales was compromised by a hacker group called TheDarkOverlord,” the site reported. Things got more confusing when the torrent files in question disappeared from The Pirate Bay. In reality, moderators simply removed the spam, as they usually do, but the reporters weren’t convinced and speculated that the ‘hackers’ could have reuploaded the files elsewhere. A few hours later another ‘leak’ appeared on The Pirate Bay, confirming these alleged suspicions. This time it was a 54GB file which actually had “DARK-OVERL” in the title. Again, at this point, none of the reporters had verified that the leaks were real. Still, the news spread further and further. TorrentFreak also kept an eye on the developments and reached out to a source who said he’d obtained a copy of the 54GB release. This pirate was curious, but didn’t get what he was hoping for. The file in question did indeed contain video material, he informed us. However, instead of an unreleased copy of the Pirates Of The Caribbean 5, he says he got several copies of an animation movie – Trolls….. In the spirit of this article we have to stress that we didn’t verify the contents of the (now deleted) “Trolls” torrent ourselves. However, it’s clear that the fake leaks trolled several writers and pirates. We reached out to Softpedia reporter Gabriela Vatu and Graham Cluley, who were both very receptive to our concerns and updated the initial articles to state that the leaks were not verified. Let’s hope that this will stop the rumors from spreading any further.